Follow the Wabbit: 5. The Wabbit and the Fibonacci Hole. 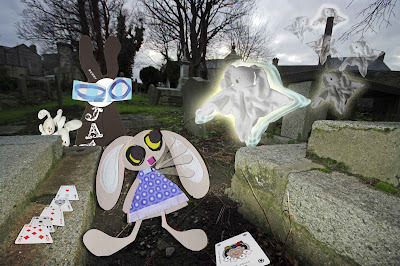 Lapinette and the Wabbit looked up to see the approach of a ghostly object. "It's Ghost Bunny!" cried Lapinette with delight. "Where have you been?" said Ghost Bunny in alarm. "We've only been away a minute," said the Wabbit. "You've been gone three weeks," said Ghost Bunny. "Everyone's been looking for you." "Well, it's good to be missed," said the Wabbit cheerfully. "It's no joking matter, Wabbit," said Ghost Bunny sternly." You're trapped in a Fibonacci sequence and you must leave immediately before you're stuck until it ends." "What's the end of the sequence?" said the Wabbit. "It's thought to be infinite," said Lapinette with alarm. "It just keeps going, like us," joked the Wabbit. "This is no time for your particular brand of misplaced humour, Commander," said Ghost Bunny. "You must find the hole in the sequence that releases you and quickly." "I'm not really sure what that number could be," said Lapinette and she thought for a bit and pulled her ears. "Maybe a self initialising quadratic sieve might do the trick?" The Wabbit rummaged in his fur. "Do you have one?" asked Lapinete. "No," said the Wabbit "I'm looking for something else." He delved long and deep took out a small paper slip. "Let's try 22223224462942044552973989346190996720666693909649976499097960" "What in Pluto is that?" asked Ghost Bunny. "It's my membership number in the Carrot Club," said the Wabbit. A sudden sharp wind froze them to the marrow. Then even Ghost Bunny's fur ruffled as the cards lifted one by one and blew all around.